KIRUHURA – People of Kiruhura gathered here; Government officials; My friend Gen. Elly Tumwiine; other members of the Armed Forces present; ladies and Gentlemen: God is good. Thanks be to God, who gathered all of us here as we celebrate with our children being united in matrimony. Therefore I thank you, Emmanuel, for gathering all these people for me; where else would I easily find them gathered in this area (Kiruhura)? I thank you, James, for inviting all of us to your home; people from all tribes and religions, young and old. That is God’s will. Some of us who are experts in party politics, we say that we are one nation; One Uganda, One people. Let me tell you this ladies and gentlemen; God who created us, made us in his image; everyone is like the other and we are all equal before God. I was telling colleagues recently, that when God was creating us, he gave us one commandment; which is that you shall love your God, and love your neighbor as you love yourself. In that second commandment which fails all of us; he told us that we cannot love God, whom we have never seen with our eyes, and yet hate the neighbour that he gave us. If you say you love God and you hate your neighbour; you are being deceitful to your God; you are lying to God. I, therefore, urge you, ladies and gentlemen, to love each other. Love your neighbour as love yourself. I heard some people urging me to rejoin the Movement. But I want to tell you this, people of Buremba and this region: before this Movement started, we were with Museveni. In 1980, I was one of the people campaigning for Museveni in this area. You refused to vote for him. You voted for Kutesa. We loved (Museveni) but you people chose to love a DP candidate Kuteesa. I and Museveni were in the UPM (Uganda Patriotic Movement). We started it on the same day in Kampala City Council. Our symbol was joined hands. It symbolised love. We spread this love of UPM around the country and we brought it here, but you refused to vote for Museveni. You ridiculed Museveni while we followed him, not because of the wealth, but because of the truth that he spoke. He went to the bush and we followed him there. I was a trained doctor with a good job. I was arrested and jailed because I supported Museveni in 1980 elections who had now turned a rebel. Gen Tumwiine was here was a soldier and never got involved in that election. After the polls, I was arrested because the person I voted for had gone to the bush. Most of the people I had in jail have never been seen. I was in jail with men like Rwancwende; he’s never been seen. His son came to see him; he too disappeared and to this day, has never been seen. Others like Karuhanga, Amb. Kananura, Justice Kabazeire; we were all in the same prison. They disappeared. The person who survived was this young girl Kabwaami, who survived because she had just given birth to a baby. We were being killed because of supporting a rebel. Fortunately, I was able to get out of prison and I escaped to Kenya from where I returned to join Museveni in the bush. I found Gen Tumwiine was the commander, in 1982. Let me tell you the bush is not easy. Many people died there. When you hear people saying they are all powerful now, I want you to know that we didn’t get ourselves out of the bush. It was God who got us out of there. Gen Tumwiine here knows, in 1984 we were looking for a way to escape into Congo and we couldn’t find it. Over 500,000 people had already lost their lives in the bush war. But people in this area were condemning Museveni, saying; “we knew he would turn our children into prodigal children and vagabonds. 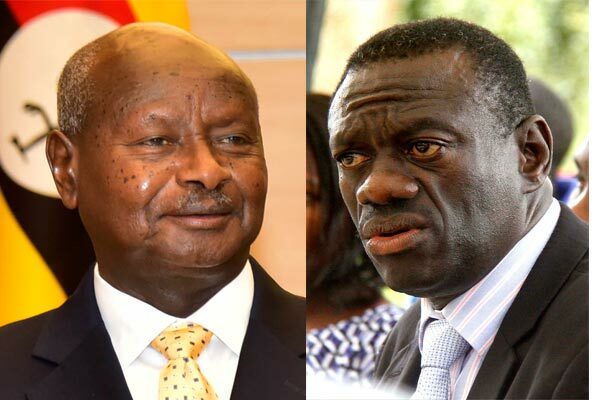 I, therefore, want to tell you, children of God, like I have been saying lately; that you are only lying to yourself when you say you love Museveni more than Besigye did. I loved him when he had nothing. Today you cannot tell who genuinely loves him or who loves him because of what he has. Your true friend is that who is with you in danger. That’s how you can tell. So, ladies and gentlemen, we shed our blood for the Movement and created it. You cannot love it more than we do. I gave my life for it. I went to the bush without a wife or a child. I was a doctor, earning a lot of money in Kenya. I left it all and went to the bush. We have one problem and if we solve it, we shall change our country forever. You must all remember what took us to the bush in the first place. Because even when we were looking for votes in this area, we were being persecuted. Even Museveni going to the bush, they were after his life. They detained him on a roadblock when he was a minister of defence and attempted to kill him. The problem then was that some people were allowed to talk while others were gagged. Justice, which I have been talking about, which God wished us all; the restraint not to do unto your neighbour what you wouldn’t want to be done to you; if we follow all this as God has asked us, this country will be better. As I was coming in here, I saw some people applauding and very happy, while others were timid. Why? We are all one people. What causes this is because some people feel they are free and have liberty while others don’t. I have been saying all this even when I was in the cabinet – our very first cabinet in 1986 – I was the National Political Commissar. I was responsible for building all the resistance councils in the country. So, ladies and gentlemen, we should remember one thing – justice. Don’t do unto your neighbour what you don’t want to be done to you. The recent election of 2016, before the declaration of the results, I was already in jail. Did I have any case to answer? Even if I had a case to answer, couldn’t they take me to court, charge me and convict me? And all the times you have heard that I am in court, have you ever heard any case that I was asked to defend myself? But I am permanently in court and prisons. Ladies and gentlemen, we need justice in this country. Thank you very much, James, for gathering us here and giving me this opportunity to tell these people to give us justice and to love God the way He loved us, and to love each other. If we do that, we will better our country. I wish you peace, may our Lord be with you all.